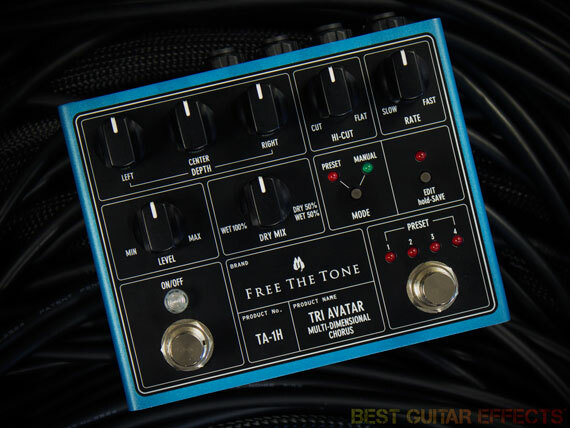 Free The Tone Tri Avatar TA-1H Review - Best Digital Stereo Chorus pedal? 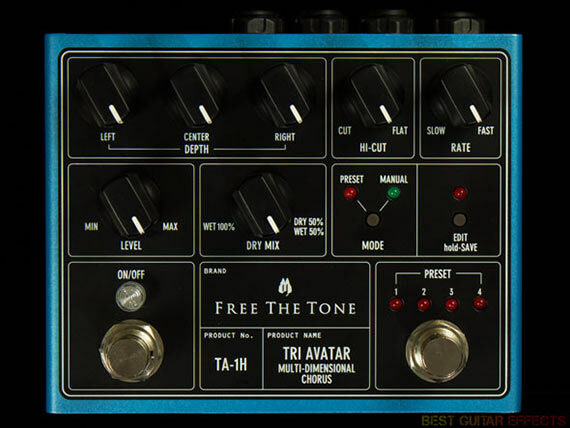 Free The Tone Tri Avatar TA-1H Review – Best Digital Stereo Chorus pedal? Besides designing and building pro rigs for the session elite in Japan and elsewhere, the Japanese company Free The Tone are also well known for their insanely high quality effects pedals. I doubt they would even consider releasing a product unless it offered something truly unique, so I was curious to see in what way their latest creation, the Tri Avatar Multi-Dimensional Chorus pedal, would stand out. Considering Free The Tone’s background in building rack-mount systems for pro guitarists, it quickly became apparent to me (and confirmed later by Mr. Yuki Hayashi himself) that the the Tri Avatar Multi-Dimensional Chorus is inspired by the legendary Dytronics/Dyno-My-Piano Tri Stereo Chorus and Roland Dimension D rack units of the 1980’s, although the Tri Avatar isn’t a clone by any means as Free The Tone sought to create their own unique chorus sound. These chorus units were originally designed for use with electric pianos and their (at the time) state-of-the-art digital emulations, but they also ended up in the racks of famous LA session guitarists like Michael Landau, Steve Lukather and Dann Huff to name a few. It’s an instantly recognizable classic chorus sound which doesn’t get a lot of love lately due to it’s association with the 80’s, but when used with taste it certainly has its place, especially in today’s retro-oriented musical landscape. The original TSC units are analog, undoubtedly somewhat temperamental, and very rare and therefore expensive, not to mention they certainly aren’t pedalboard friendly. To my knowledge this is one of the first attempts at implementing a similar three voice chorus in guitar effects pedal format, and I’m excited to have the chance to spend some time with it. With a single chorus, the wobble is generally quite obvious, but with multi voice chorus like the Tri Avatar, the modulation is a lot more complex and rich, due to the difference in phase and modulation depth. The ‘tri chorus’ concept works well in both mono and stereo, so stereo operation is by no means essential to experience the Tri Avatar the way it was meant to be. In Mono operation all three phases are simply mixed down to the single mono output, with the option of blending in the clean signal as well. In stereo operation the first and middle phases are fed to the Left output, and the middle and third phases are fed to the Right output, while the dry mix is fed to both. Keep in mind that, like with the original TSC rack units, these voices share the same LFO and therefore the same rate setting, but have individual depth controls. Another notable feature of the Tri Avatar is its preset selection foot-switch, allowing the user to switch between a total of four completely independent presets, whenever the unit is placed in ‘Preset’ mode via the ‘Mode’ button. During this time all other controls are deactivated and one of the four LED’s positioned above the foot-switch illuminates, indicating the currently selected preset. As soon as the unit is switched to ‘Manual’ mode all controls become instantly active and the sound reflects their current settings. A second button labeled ‘Edit’ is used to modify an existing preset, so initially the sound is that of whichever preset is currently selected and changes are only made when specific controls are tweaked. After selecting the desired preset slot, saving is done by holding down the ‘Edit’ button for 1.5 seconds regardless of whether a new sound has been created from scratch using the ‘Manual’ mode or was tweaked by entering the ‘Edit’ mode from ‘Preset’ mode. Cosmetically, the enclosure has the distinctive Free The Tone matte finish, black on blue in this case, with a very sober but detailed styling that fits in nicely with the rest of the Free The Tone line-up. The connections (In, Out L, Out R, Exp, MIDI and 9v) are neatly top mounted, making for practical board implementation. Its size is actually fairly modest and, although a somewhat unique design, the enclosure is sturdy, and all the inputs, controls, and buttons feel solid. I particularly appreciate the classy buttons instead of the usual toggle switches. Unfortunately, I was not able to open it up to take a peek inside since it would require removing a lot more than the screws on the side. Visit Free The Tone for more information about the Tri Avatar Multi-Dimensional Chorus TA-1H. The first thing I noticed after plugging in the Tri Avatar is that the sound is very clear and detailed, possibly due to the 24-bit AD/DA converters and 32-bit processing of the chorus signals. If this is too much sparkle, lowering the ‘High Cut’ control makes it sound closer to the warmer analog chorus tones like the classic Boss/Roland CE-2, which were used as the starting point for the design of the original analog Tri Stereo Chorus rack units. The ‘Level’ control is fairly subtle, clearly meant to match the effect volume with the bypassed signal, or provide a slight boost if necessary, and the ‘Mix’ control blends in the clean signal when a more subtle chorus is required. In general the Tri Avatar isn’t the most extreme chorus out there, even with the ‘Rate’ and ‘Depth’ controls maxed out, and it’s clearly designed for more practical and conventional applications. Most importantly though, due to the more complex modulation, the sound is pretty mesmerizing, and I’ve found that it indeed does do a great job at recreating those 80’s rack unit type clean chorus sounds, especially when paired with some compression/detuning/delay in stereo, but when set to a faster rate and almost 100% wet mix it does a decent faux ‘Leslie’ rotating-speaker sound as well. Navigating the unit is pretty intuitive, from recalling, storing and editing presets, to assigning the expression control. Although at first it makes sense to keep the manual nearby, after a little use I’d only need to reference it for maybe the MIDI table and such. The Tri Avatar’s small classy buttons used to switch between the three different modes are somewhat uncommon on guitar pedals but work really nicely. In preset mode, moving the controls doesn’t affect the sound at all, which did take me a little while to get used to, but on the other hand, this means there is no risk of accidentally changing the settings during a gig or in transport. Although I did not test its MIDI functionality, the manual is clear as can be in this regards, and judging by our experience with other MIDI enabled Free The Tone products like the Flight Time Digital Delay and ARC-53M Audio Routing Controller, the setup should be a breeze. 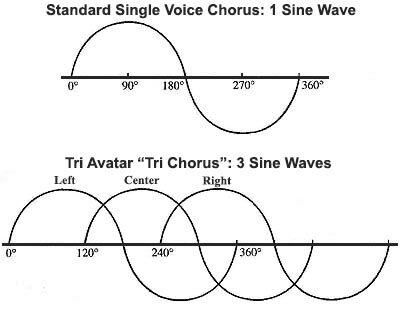 As far as possible improvements go, most notably there is no stereo input, which means it requires a little planning to integrate the Tri Avatar in certain stereo rigs, and I can’t help but wonder what the chorusing would sound like with an individual rate control for each phase as well as that could have provided some interesting poly-rhythmic chorusing effects. It’s understandable Free The Tone decided against both of these options however, as they would have added a whole new level of complexity to the circuit. In regards to the ‘Dry Mix’ I could imagine situations where a setting even more subtle than a 50/50 dry/wet signal is required, although the current range does allow for finer control in the most crucial area, and it’s obviously something that can be solved by using a wet/dry setup. As for the expression pedal input, I liked this so much that it made me wonder how it would be to control any (and all combinations) of the other parameters this way, maybe with a customized range. This can obviously be achieved via MIDI, but that would unfortunately require a much more elaborate setup. When tweaking parameters in real time (and possibly via MIDI?) I noticed there is some slight clock noise while the ‘Level’ control is being turned. This is not the case with any of the other controls, and the only way I could see how this could be a big deal, is if one would use it as a volume control, which is a fairly exotic way of using a chorus pedal anyway. But that shouldn’t ever be an issue in most set-and-forget situations or when simply recalling presets. Considering all of the Tri Avatar’s features, Free The Tone may have a hit on their hands with guitarists, and perhaps even studio engineers & producers, looking to add some incredibly lush and beautiful chorusing to their effects palette. The Free The Tone Tri Avatar Multi-Dimensional Chorus is a joy to play, especially in stereo, with its three separate modulation cycles creating a richness that really stands out from any regular chorus pedal I’ve tried. The sound quality itself is as pristine as it gets, and I really enjoyed the wide variety of sounds available which reinvigorated my appreciation for chorus effects in general, as it does both subtle modern sounds, as well as those over-the-top crystal cleans. The preset switch, MIDI implementation and expression pedal input add another layer of usability, making it a very solid addition to any medium sized pedalboard or full fledged pro rig without being overwhelming, and like any Free The Tone product I’ve had the pleasure of plugging in, build quality really is second to none. That concludes our Free The Tone Tri Avatar Chorus review. Thanks for reading. Want to buy the Free The Tone Tri Avatar? Please make a review for the Free The Tone Flight Time Delay if u could!